For a culture addicted not only to social networking, Twittering, and living on a constant schedule, the last thing we believe we have is time. For many of us, time is money, but to some-namely Sergey Dvortsevoy-time is not of the essence, but rather authenticity is. Tulpan, Sergey Dvortsevoy’s first feature film, has a rare authenticity that most films lack. Rather than focus on effects and high tech cinematic devices, Dvortsevoy harkened his attention to creating an original film set in Betpak Dala (Hunger Steppe) in Kazakhstan. The land is inhabited only by shepherds and the occasional small village. While working for a Russian aviation company, he fell in love with the country side as he flew over across the Steppe. Immediately after, it became his dream to film there, to show the life of solitude, isolation, work. Some might call it crazy, others impractical. But for Sergey Dvortsevoy, the only way he could feasibly make Tulpan was to settle in and allow the film to take its shape. He did something most filmmakers are not willing to do: wait. And wait they did. Did you and the crew have to live like nomads to shoot this film? Sergey Dvortsevoy: Although we built our own camp one kilometer away from the set where we had water and electricity from generators the crew lived a life very close to nomads on the steppe. We also spent a lot of time living with local shepherds and with the actors because they already moved into a jurte (traditional tent house) one month before shooting and really lived there together as a nomad family. Samal Eslyamova (Samal) did all the work of a shepherd’s wife and Ondasyn Besikbasov (Ondas) actually worked as a shepherd. A lot of the things he does in the film he experienced during this period himself. All this was necessary to give authenticity to the film. Ondasyn and Samal had never lived in a jurte before. Samal is from the north of Kazakhstan, where life is much more European. So the shoot was especially hard for her. Approximately how many shepherds and their families are still living this nomadic existence in the steppe? Are they dying out as more and more young people like Asa move to the city? Actually there are still a lot of families living like nomads in Kazakhstan. But it’s different compared to the times of the Soviet Union. Very close to the life that Samal and Ondas live in the film, which is considered a modern life. Then there are different kinds of nomads. Very few have their own livestock. Most are hired by big sheep owners to tend to their sheep and get paid for this in money or in livestock. 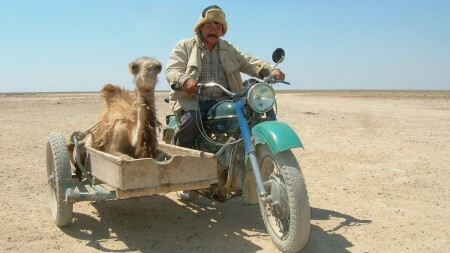 But they all still live in jurtes in the steppe and travel around hundreds of kilometers a year. Some of them are very poor. What is shown in the film is a realistic portrayal of the current situation. Almost all young people want to go to the city. Because they think they can make good money there. But then you see them in the big city Chimkent for example sitting there waiting for a job they cannot find. So they end up as construction or temporary workers if they don’t have a special profession. People like Asa and Boni would not find what they are looking for. It appears that the long, often time’s grueling production of Tulpan is paying off. Critics and cinephiles alike are singing Tulpan’s praises. A.O. Scott of the New York Times recently wrote nice piece on the film, which also garnered the honors of Critic’s Pick. As it travels to festivals and art-house cinemas across the country, it seems even more praise is inevitable. Recently I read a review that compared Tulpan to the works of John Ford. Although I initially did not see the relation (because, of course I immediately thought of John Wayne), it soon made sense. Ford too was keen on potentially tedious shoots, especially in his early works, and the vast expanse of the landscapes is an obvious similarity. It now seems quite natural that he would be compared to John Ford, and in a sense, this is a Kazakh version of a John Ford film, yet the spatial beauty and breath of the characters and land make it so much more. Tulpan screens in the Walker Cinema May 8th & 9th at 7:30 pm and May 9th and 10th at 2 pm.